There are a lot of different Fun and Stylish Sunglasses that you can get. Make sure they are UV 400 Protection though. Bring a few pairs though. They often get lost. Some people use Ski Goggles which have a dark visor. That's not handy at night. These Welding Goggles can be used both Day and Night. Plus they are easy to Customize. This Middle Eastern scarf has been used for thousands of years in the desert for a reason. Extremely versatile clothing, mask, flag, bag and more. An assortment of styles, that don’t make you look like a nurse or doctor walking around. These are a great find. Wash - reuse - pick from a variety of styles. An essential part of you Burner Gear is a good mask. These medical grade dust masks are a cheap and easy solution for a large group to get masks. Buy a pack and give them out as gifts. Sure you can use some markers to make funny faces on them, but the fumes may make you feel a little funny. Reduce exposures to large particles. One size fits all. Moldable metal noseband. 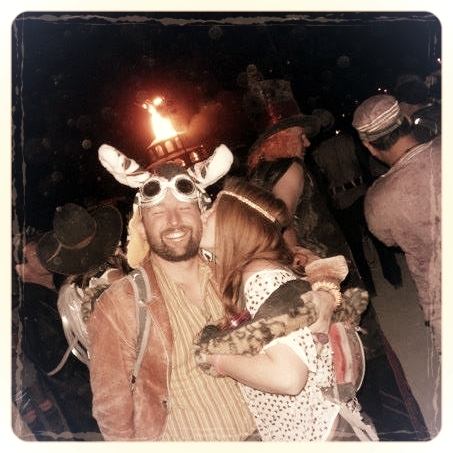 Yes, it does rain at Burning Man. When it does it can come down very hard. Some folks embrace the wet and the mud, others like to keep dry. Either way an emergency poncho in your bag can really help. Rain Poncho: Disposable Emergency Rain Ponchos for Adults In Bulk (5 Pack) Including Drawstring Hood, Assorted Colors, grab a pack for your group, you can always gift them.